How would you like to save money on skin care brands that you buy regularly? How about saving money on products that rank low in toxicity on the EWG Skin Deep Database (now I have your attention)? 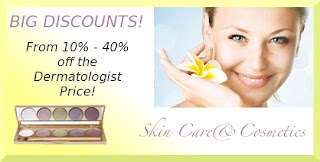 You may want to check out Complete Skin Care that offers top brands at discount prices and free shipping on all orders over $50 to top it off. There is still time left to enter the Complete Skin Care contest on Facebook for a daily prize giveaway through November 30th. You can also shop directly on their Facebook page and get the latest scoop on great deals, discount codes, and product updates. I'm sure you would find more if you look around and the prices offer nice discounts up to 40% off the dermatologist prices. Disclaimer: I received payment for this post, I have bills too. I decided to share this information with you because I genuinely thought it may be of value to my awesome readers! Thank you, you sure made that easy!